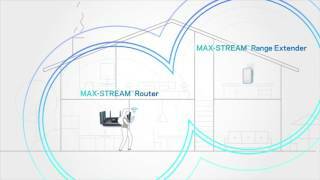 Linksys EA7500 Max-Stream™ AC1900 MU-MIMO Gigabit WiFi Router is rated 4.5 out of 5 by 321. The Linksys MAX-STREAM AC1900 provides two dedicated WiFi bands with combined speeds of up to 1.9 Gbps, which is double the performance of a single band. Experience powerful WiFi coverage throughout a medium-size house. The Linksys MAX-STREAM AC1900 features MU-MIMO, the latest advance toward uninterrupted, simultaneous WiFi connections. Our MAX-STREAM AC1900 Multi User-MIMO Router offers two dedicated WiFi bands that deliver combined speeds of up to 1.9 Gbps. It also allows you to make your time online more efficient: simply assign high-bandwidth activities, like 4K video streaming, to the high-speed 5 GHz band, and leave basic activities like email to the 2.4 GHz band. Enjoy fast-paced WiFi activities such as online multiplayer gaming with the MAX-STREAM AC1900. Powered by a dual-core processor, it is capable of handling three simultaneous data streams. This results in improved WiFi performance and faster WiFi speeds to more devices. 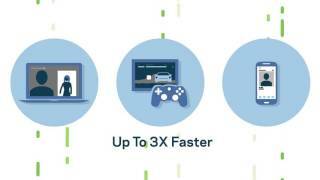 Connect more devices and share files at speeds 10x faster than Fast Ethernet with four Gigabit Ethernet ports. Connect a storage device and quickly transfer files. Or, share devices such as printers across your WiFi network using the USB 2.0 and USB 3.0 ports. Direct WiFi signals to each of your mobile devices to increase signal strength and coverage with our MAX-STREAM WiFi router using Beamforming technology. Play video games, listen to music, check emails, shop online, stream HD movies, and more, without having to worry about dropped signals. Rated 5 out of 5 by Tesla from New Router, New look, New features! The new Linksys EA7500 Max-Stream deserves to be taken seriously with the antennas reaching 6-inches in length and its small form factor design. This router is packed with new features. Wi-Fi signal is rock solid and never had signal loss. Gaming and 4K streaming running without any issues. Cellphone app is rock solid and did I mention the setup is so easy like 2 minutes. I threw everything I could to this router gaming, video streaming, music streaming, and it never failed on me. One feature that could be added is bandwidth utilization. In conclusion, very easy set up, high Wi-Fi range, wall mountable, and very stable router. Its a must buy router. Rated 1 out of 5 by JamesLR from Disappointed in Linksys! Thought I was in for an upgrade. After owning several Linksys and Netgear routers this one is the most incompatible and most difficult to configure. It's passable albeit expensive if you just want a wireless router to run your laptop and tablets, but I couldn't get it to identify my wired Vonage modem and six wireless cameras via the LAN let alone through the cryptic port forwarding configuration. After installing firmware, re-setting twice, re-booting modem, routers and computers, re-configuring cameras I gave up and re-attached my two channel $99 Netgear R6250 and was back in service. I can't speak to reliability, range or speed; I never got it to work properly. Bought it on a Wednesday, returned it on a Friday. Rated 1 out of 5 by RRuiz from Extermerly disappointing. I have had this since Nov 20, 1016. I find myself either restarting this every 7-10 days or resetting it to factory setting and setting up the router from scratch every other month with the help of the support team. At first I thought it was the firmware, but it has the most recent firmware update. I thought it was the Spectrum/BightHouse router so I paid 44.00 US dollars for a service call to replace the cable modem. I am no better off then before and out 44.00 dollars. Linksys router still drops the connection and runs slower then the Spectrum/BightHouse router. Would return it for Netgear wifi exteneded if I could get my money back. Rated 1 out of 5 by Tonyron227 from Not up to my high standards I received this new router from Linksys Friends and Family and I must say that I was highly disappointed after the easy setup. I performed a simple speedtest with the web portal and it was like something was holding it back. My main computer is an ethernet connection and I rely on its download speed on a daily basis. I checked my speed without the router and everything was fine. I reconnected the old router that I have been using for the last year and it performed fine. I reconnected the Linksys and it was like there was a guvernor limiting the speed. There may be some settings that could be adjusted to eliminate this problem but most people want an easy plug and play type of setup. Rated 5 out of 5 by Wolfen90 from Excellent speed and easy setup The fastest router and one of the easiest setups there is. Happy that it can handle all the streaming and gaming without and lag or having to wait to load. I have done a speed test at different intervals to see, and even at the peak time it was still faster and able to handle a PS4, Xbox 1, 2 4K televisions streaming movies, and 2 IPhones downloading songs and movies. This Linksys Next gen AC1900 MU-Mimo gigabit router is truly built to handle all your next devices, without any lag during streaming and quick load times. I would definitely recommend this router for any one that streams movies or music and plays video games. You won't be disappointed with your decision with this router! Rated 5 out of 5 by drklbc from Improved speeds, reliability & easy setup OTB!!! I received this to test out and I must say that I am in LOVE with the performances of it! From the ease of the setup, web based app to manage the router and the overall ratings in speed from using it with Charters Spectrum. This allows me to get overall range within my apartment complex and to my car on the street. It manages to keep up with heavy online gaming (2 PS4 & 1 PC), online streaming (Netflix, Hulu, Plex & Amazon). I am impressed overall... wait for it's release and BUY IT. Thanks Linksys. Rated 4 out of 5 by Loomis1975 from Very good mid-end router This router performed slightly under a Netgear Nighthawk R8000 in terms of speed and range (disabling the 2nd 5 ghz network on the Nighthawk for a fair comparison). My multi-story brick house with large central brick chimneys is hard on wireless signals, so this EA7500 performed better than anything other than the Nighthawk has. This router has MU-MIMO, of which I had no compatible devices to test it with. Some of the first devices to make use of MU-MIMO will probably be cell phones released this year. So if you have multiple smart phone users who consume a lot of media on them, this might be a router up for consideration when upgrading. Rated 5 out of 5 by Bud Jones from Powerful and Easy to Set Up This is my third Linksys router. The first one I gave to my parent in-laws when they finally decided to join the twentieth century five years ago. The second just could not handle the demands of my UHD smart TV but it was still going strong. I am very pleased with this router. Setup was quick and easy. I set the network name and password to match the previous router so I didn't have to change all of the wireless devices' configuration. This puppy easily handles streaming to the TV, phones, laptops and iPads all at the same time without breaking a sweat. When technological advances dictate that I upgrade my router, Linksys will be my first choice! † PCMag logo is a trademark of Ziff Davis, LLC. Used under license.